Das Haus wurde 1900 erbaut und hat viel von seinem ursprünglichen Charme. Dieses traditionelle Haus verfügt über formelle Wohn- und Esszimmer. Ausgestattet mit einem Queensize-Bett und einem Doppelbett, ist es bequem für vier Personen. Parkplätze abseits der Straße stehen zur Verfügung. Waschmöglichkeiten befinden sich im Keller. Ein separates Studio-Apartment im Untergeschoss ist nicht enthalten. (erkundigen Sie sich nach Verfügbarkeit und Preisen für dieses separate Studioappartement). 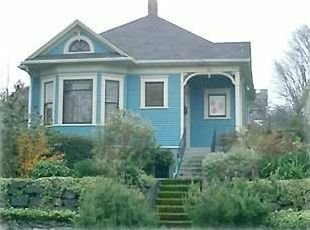 In der Innenstadt von Seattle gelegen, befindet sich dieses Haus 10 Minuten von Seattles Capitol Hill, Madrona und Madison Park und der Innenstadt von Seattle entfernt. Die öffentlichen Verkehrsmittel sind nur einen Block entfernt, so dass Sie alles, was Seattle zu bieten hat, bequem erreichen können. Zu den nahe gelegenen Annehmlichkeiten zählen ein Café, Restaurants, ein zentrales Kino, Supermärkte und ein Pilates / Yoga-Studio. Dieses Haus ist in der Stadt Seattle (# 5910019) als Unternehmen registriert, daher gelten alle anwendbaren Steuern. The place worked great for us, the hosts were extremely responsive and on top of details, and we certainly stay there again if we return to the area. This is a great house full of character in a charming neighborhood. The location is perfect for out-of-town visitors who want to sample Seattle. A cozy little coffee shop and tap room are both just a half block away, as well as a bus stop with an easy, direct ride into downtown. The home has a vintage feel with modern convenience. It was a great retreat and home base for our day trips in and around Seattle. Everything about my stay was perfect! This is the perfect house! It was the right place and location for me and my family to stay over the Thanksgiving holiday. The house and neighborhood are both charming and I would definitely stay here again. Thank you Cindy and Jose for sharing this lovely home! We had a great time in this very clean, warm comfy cottage. Well equipped with everything you need, and good location for public transport. Happy to recommend. Great older home; very comfortable and conveniently located. Would happily stay again.